The scenic Freisaal Castle is easily accessible walking from Nonntal - though there were no real reason why you should, if there wasn′t other things to explore nearby: such as the modern Science Faculty building of the University of Salzburg, constructed until 1990, the Botanical Gardens and the most pleasant part of the Hellbrunn alley, leading straight to Hellbrunn Castle. 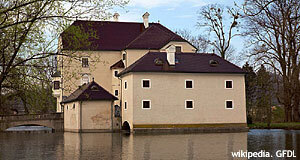 Back to Schloss Freisaal, it is certainly worth a closer look: the oldest record of the building dates back to 1392. The name is derived from "Freudensaal", meaning "pleasure hall". Its original purpose was just that: to serve as a pleasure castle for Prince Archbishop Pilgrim II. von Puchheim. Ernst von Bayern re-modelled the building in 1549. A fundamental change in the building′s structures was caused by construction work done in 1907, which transformed Freisaal Castle into a somewhat messed up villa. However, frescos in the second floor by Hans Bocksberger the older from 1558 remained preserved, one of the paintings showing Prince Archbishop Michael von Kuenburg moving into Salzburg. Today, Freisaal Castle is private property and is not open to the public.